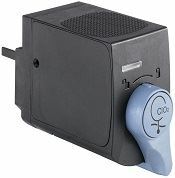 The Type MS02 sensor cube for the Bürkert Online Analysis System can now measure either the free active chlorine content or the chlorine dioxide concentration of the water sample. The system can now measure either free active chlorine or chlorine dioxide. The Online Analysis System is designed for automatic monitoring of the most important analysis parameters in the treatment of drinking water. The Type 8905 Online Analysis System is a modular system for fully automatic monitoring with a single platform. The basic version provides sensor cubes for five factors: pH value, redox potential (ORP), conductivity, chlorine and turbidity. The capabilities of the Online Analysis System have now been expanded and precise amounts of chlorine dioxide are added to drinking and process water for disinfection purposes. The sensor makes it possible to continuously monitor and document the concentration and the effectiveness of the disinfection. Exhibition will present strategies and new technology to address flooding problems. Digesters will have the capacity to treat 131 tonnes of dry sludge. Information is supplied in real time and historically across Veolia's secure Cloud-based portal. Evoqua Water Technologies to design, manufacture and install a new wastewater treatment system in Connestee Falls, North Carolina.